I read the news today in another Spanish site and I ran to find a confirmation in any other site and here is what I found at BBC News. Although no exact date has yet been given, Microsoft said price cuts would be introduced in 70 countries. In the US, the cost of the most expensive version, Vista Ultimate, will be reduced to $319 (£161) from the current retail price of $399. I have to say that as MVP I have transmitted to Microsoft my concern about the excessive and abusive prices on all Microsoft products. Prices that are pushing OEMs to find other solutions from the point of view of Operating System installed. There are even OEMs that have been selling their products without any OS to make them more appealing. And I have the experience that products that were very hard to sell with Microsoft OS became best sellers as soon as they were sold without OS. The time where Microsoft could do something to have their OS in all OEM machines sold around the world is over and it's time for Microsoft to understand that. There are more and more machines coming out with Linux. And they are being sold. The time when Microsoft could stand and say that they have the best OS in the World and that was the reason why it was installed in 100% of all computers sold is over. Today users are glad to go with something "less perfect" but a lot cheaper. Less pretty but cheaper. They prefer to go with Linux instead of Vista or they prefer to install Open Office than Office. In both cases they do the job and they do it right, which is more important. I installed Vista SP1 in my Samsung Q1 about a week ago and was lucky enough to get everything working from the first moment without any problem. But that's not the case for many users that have reported the installation process to go crazy in a endlessly reboot. Here is a link for 3 possible solutions brought by Microsoft for this issue. This problem occurs when Windows Update is installing update 937287 for Windows Vista. There is not too much information about this new UMPC coming from Korean company KaonMedia beside a few pictures posted at Aving USA. 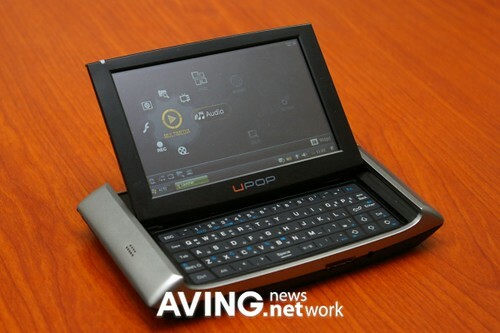 KaonMedia(www.kaonmedia.co.kr) launched a new concept of 4.8-inch PMP ‘UPOP’ in Korea market, which features slide-and-tilt LCD touchscreen with 800 x 480 resolution. This is a comment published today in PC World about a Federal Judge in Seattle who gave the OK to a class-action suit against Microsoft for distributing "Windows Vista Compatible" or capable labels. A federal judge in Seattle, Washington has given a lawsuit filed against Microsoft for its "Windows Vista Compatible" labeling program an important thumbs ups ensuring the case will move forward as a class-action. The gist of the case is this: before Windows Vista was released, during the 2006 holiday shopping season computer manufacturers put "Windows Vista Compatible" stickers on computers that fit the hardware requirements for Windows Vista. The catch was that most of those computers only fit the minimum system requirements for the most basic version of Vista (Vista Basic). Naturally, customers who bought a Vista compatible PC were disappointed when they found that higher-end versions of Vista didn't work. So mad was Washington residents Dianne Kelley and Kenneth Hansen which filed a lawsuit against Microsoft alleging the Vista capable stickers were misleading. New PC owners were burned because they didn't do their research before buying a computer. Why aren't the lawyers going after the PC manufacturers who put those labels on their PCs? After all Microsoft does not actually manufacture computers. So... who is guilty, Microsoft or OEMs? To be or not to be. Was the Windows Vista Capable label misleading? I have been testing for a while a Wibrain B1H, a very well made compact UMPC and I have been aware since long time ago about the plans of Wibrain to release a version of this machine using Linux. Well, today it has been officially announced in Korea: there will be release very soon a version of Wibrain using Linux according to a news published at Asing USA. WIBRAIN(www.wibrain.co.kr) announced the launch of its entry-level UMPC ‘B1L’ in Korea market, which runs on Ubuntu Linux as well as supports Microsoft Office software. That's the title of a very well written article published at Pocketables.net. A quick look at the official specs chart appears to confirm that the 2G Surf is identical to its brethren in every way except that the 4G Surf has a 4GB flash drive; the 4G has a 4GB flash drive, webcam, and longer battery life; and the 8G has all of that plus a bigger SSD (8GB) and more RAM (1GB). Great! Buying the 2G Surf will save those who don't need the extra storage $50 and those who also don't need the webcam and extra runtime $100 with no additional sacrifice. That's what the official product page would lead consumers to believe, anyway. The truth is that the Eee PC 2G Surf is so compromised that at its current price, it's not worth buying at all. I agree fully with the author of this article. But even more, to me the Asus Eee is only comparable with one of those toys from the One Laptop for Child campaign. If you are looking a cheap laptop capable of doing all that your teenager child wants to do, do not waste your money and "time" - yes because you will have to spend sometime talking with the store to get it returned back. If you still want this machine and you are willing to spend time upgrading it - not the Surf but the 4G ones - then check JKKMobile, JKK has all kind of information about all kind of hardware hacks possible on this subnotebook. The Q1U on steroids is already in stock in some online stores according to a post at Origami Project Forum. Using a 1.33 GHz Core Solo Intel processor will boost this UMPC performance and place it on the top of that list competing only against Sony's UX series. Microsoft has revealed a list of programs known to have problems with the newest SP1. Service Pack 1 for Windows Vista is an important update for Windows Vista. Windows Vista Service Pack 1 (SP1) contains many security, reliability, and feature updates for Windows Vista. A program may experience a loss of functionality after you install Windows Vista SP1. However, most programs will continue to work as expected after you install Windows Vista SP1. A few days ago I have published here about a new UMPC concept video that I found in Youtube. In that concept was used Samsung trade mark and a model number and that made me believe that it was a UMPC Concept video created by Samsung that somebody found/got and published in Youtube. Never in my mind I thought that somebody could have been used the brand of such respectable company to publish a concept video. It's something that probably it's ok if you are showing this video in your classroom but completely unacceptable if you are thinking about publishing it in the WEB. Well, my mistake, I thought that to avoid this kind of error was enough not to visit MySpace - you know what I mean. The concept is really good and I hope that in the future we will see something like this coming out with a real Brand Name and Model Number. When or will be this UMPC ever release? It's unknown. So far the only piece of information that's clear is the name: Samsung P9. I personally will add this model number to my notes about UMPC to follow up because without any doubt, this is one of the best concepts that I have seen in two years. A friend pointed me to this video where Vista is advertised using a Samsung Q1 UMPC. For those who may think that this is not possible, I have been using Vista in my Q1 for almost a year already. Amazon is updating the software in the Kindle and will be done all via kindle's wireless connection. We're constantly working on improving your Kindle user experience. When we make improvements to the Kindle software, we'll send you information about the update via e-mail. Please refer to the links below for more information about Kindle updates. The most recent version of the Kindle software is Kindle 1.0.4 released February 2008. One of the problems that new UMPC and Tablet PC owners find when they start to learn about all this new world of "ink" is that Microsoft started to support "ink" in Office 2003. So if you have Office 2000 you can't enjoy this feature in your Tablet PC or UMPC. There is also the case of new UMPCs like the Everun and the Wibrain that are sold with Windows XP Home Edition which does not include any of the Tablet PC functions, in this case there is not way you can annotate your office documents unless you use... Meanders' Annotator for Microsoft Office. Meanders' Annotator for Microsoft Office enables you to write directly in Microsoft Office (97/2000/XP/2003/2007) documents with its intuitive ink and handwriting support. 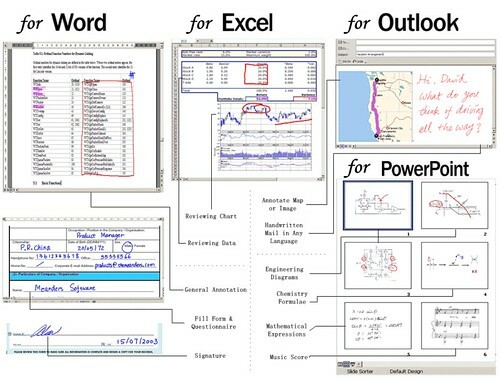 You can review, comment on documents, draw and annotate tables, charts, diagrams, etc inside Microsoft Word, Microsoft Excel, Microsoft PowerPoint all with your handwritten ink. You can also write and sign handwritten messages in any language inside Microsoft Outlook# when using Microsoft Word as your e-mail editor. All documents will be saved in their respective native Office file format and can be shared immediately without any compatibility problem. I have to say that I just tested it in my Windows XP PRO at work using a Wacom Digitizer and I'm really impressed. You can get using this software virtually everything you get in Office 2007 in a Tablet PC for less than 20 dollars, no matter what version of Office or what Operating System are you using. HORSHAM, PA (Jan. 15, 2007) — Allegiance Technology Partners (ALLTP), a computer reseller company specializing in tablet PCs, has been selected by Hunter Douglas Window Fashions to offer customized tablet PCs to all of their dealers. The partnership allows Hunter Douglas dealers to purchase tablet PCs that were specially configured to fit dealer needs. The tablet package includes a Motion Tablet PC, Disto laser measuring device and the Hunter Douglas DirectConnect® software. This weekend I had the chance to check the Sony PRS-500 eBook Reader. It's not a secret that I have been reading my Amazon Kindle for around a month already so it's impossible to have a new reader in my hands and do not compare it with what I already have. First of all, I have to say that the Sony design is impressive, like all Sony designs, if you compare it to Kindle this one looks like a well designed toy, nothing more. But... Looking good is not the most important thing in gadgets. The search functionality in the Kindle, the capability of writing short notes and the overall software usability is a lot better in the Kindle. After checking the PRS-500 I do not have any doubt that the formula proposed by Amazon where the eBook Reader can be used without connecting it to a PC is the way to go. And another point is "Searching", when you are reading and when you are in a library, one of the tasks that you more often perform is searching. You search for words or topics within your library, you search for words in the book you are reading, you write notes, you highlight sentences or paragraph and often you look for those notes during your research. You can't do any of that in a Sony Reader but you can in a Amazon Kindle. Recently I was reading an article of Steven King about his Kindle where he wrote that the Kindle Keyboard was not that good but for him was enough because the Kindle was for reading not for writing. And I fully agree, but the fact that the Kindle has that little keyboard makes it one of the best readers in the market. But this comment is about the Sony PRS-500 so let me end it with few pictures of this wonderful eBook reader. SUNNYVALE, Calif., Feb 05, 2008 — AirMagnet, the leader in security, performance and compliance solutions for wireless LANs, today announced that its award-winning AirMagnet Laptop Analyzer and AirMagnet Survey are the first WLAN security and management applications to offer platform support for Ultra Mobile Personal Computers (UMPC's). The first device AirMagnet will support is OQO's model 02, an award-winning UMPC that is the world's smallest fully functional PC. "This new UMPC support enables end-users and resellers — for the first time — to plan and monitor all aspects of the enterprise WLAN with a PC that can fit in their pocket," said Chris Roeckl, vice president of marketing at AirMagnet. "Customers still get our award-winning WLAN applications, but now they have an alternative to traditional laptops and they can select the platform that makes the most sense for their business environment." AirMagnet's Laptop Analyzer is the industry's most popular mobile field tool for auditing and troubleshooting enterprise Wi-Fi networks. It proactively diagnoses WLAN problems and helps IT staff quickly solve end user issues while automatically detecting security threats and other wireless network vulnerabilities. AirMagnet Survey is the market-leading WLAN planning solution that enables customers to collect live signal, packet and spectrum data during site surveys, and simulate and measure network performance in the most scientific way possible with the most accurate depiction of the real user experience. UMPCs are small form factor PCs that run standard Windows XP or Vista™ operating systems with display sizes of 7 inches or less. The OQO model 02 delivers computing performance powerful enough to perform critical tasks and meet enterprise productivity requirements anywhere and anytime, all in a device that weighs less than one pound. The model 02 is a full-powered and full-featured PC with an integrated thumb keyboard and built in Wi-Fi, 3G WWAN and Bluetooth capabilities. The form factor is highly ergonomic and ideal for a user who needs to perform computing tasks while mobile — even standing up or walking around — and it can be docked at a desk to a standard full-size display, keyboard, mouse, and other peripherals. The OQO model 02 supports standard Windows applications allowing users to accomplish their tasks in any environment and respond immediately to any issue in the field. For more product information, please visit OQO. AirMagnet Laptop Analyzer and Survey products are supported on OQO model 02 configurations with 1.0GB RAM running the Windows XP™ Professional operating system. "OQO computers are designed to empower mobile end-users with true enterprise application access. The ability to support AirMagnet's WLAN security and troubleshooting application is a perfect example of the value the OQO model 02 can offer," said Bob Rosin, senior vice president of marketing and alliances at OQO. "Working together with AirMagnet, we are able to provide customers with a truly innovative, accurate, and cost-effective solution." The second video was really unbelievable. That's the kind of Tablet I need for my daughter. For what I can see, TabletKiosk is going to start selling soon a device that I think is the same. You can see in the recently opened todoUMPC online store for USA costumers here (Affiliated Link). This is a really very good news published at Intomobile.com, I'm really dying to see what this Silverthorne is capable of, I do not want another nasty surprise like the performance and "battery life" that we have seen in the A110 and A100 processors. Intel is slated to debut the Silverthorne microprocessor later this week. As a scaled-down x86 chip, Silverthorne can top out at 2Ghz (2W) to do the heavy-lifting, while also dialing-down to a more mobile-friendly 600mW operating range. Silverthorne should bring Pentium M performance to the mobile space. This weekend I prepared a short video for those asking me how good is the Wibrain playing videos. For those that do not understand the Quixote's Language basically I played 3 videos, the first one is an Divx at around 800 kbps, the second one is another Divx at more than 4000 kpbs (HD) and the 3rd one is a DVD copied into the Wibrain Hard Drive. In my video you can see that the Wibrain played acceptable in these tasks.